I recently gave away some small fig (Ficus carica ‘Stella’) plants that I’d grown from cuttings. I was asked how to look after them, so I figured this would be a good topic for a post (it has been a while…). There are several species of fig in cultivation; they make easy and attractive houseplants, but only Ficus carica produces edible fruit (at least, fruit that’s worth harvesting). That’s the species I’ll be talking about. The following is a mixture of personal experience and research. Figs are native, more to less, to the Middle East and thus prefer Mediterranean conditions: fairly dry soil that’s not too rich or heavy, and lots and lots of sun. Despite that, they’re pretty adaptable, so it’s not difficult to grow figs in containers here in southern Ontario. They’re generally reliably hardy to USDA Zone 8; some cultivars are hardy to Zone 7 or Zone 6 or even colder with enough winter protection. ‘Stella’ is one such. They can be placed outdoors in summer and will thrive in full sun; in winter in colder areas they need protection, but they will tolerate light frosts for short periods. Container: Figs seem to do better when their roots are somewhat restricted, so it’s best to plant them in containers that one would think are a little too small for the size of plant. Consequently they don’t need to be repotted often even though they are fast growers. Every three years (or two at most) for mature plants should be enough. You can even put one back in the same pot if you prune the roots. Soil: Nothing fancy; standard potting mix will do as long as it is light and free draining. I tend to use topsoil mixed with vermiculite, mainly because that’s what I’ve got at hand. Water: Again, not fussy, but they prefer to be on the dry side. Anything grown in a pot/container will need a little more water than if it’s grown in the ground, and that does apply here. I keep mine in full baking afternoon sun and I feel guilty if I don’t water it daily, but it doesn’t mind a bit if I miss a day. I hear that too much water affects the flavour of the fruit, but my palate isn’t refined enough to notice much difference. Light: They will take as much as you can give, but will also adapt to lower light conditions. I have tried them in morning sun/afternoon shade and they did just fine. A sunny window will do for indoor plants as well. Feeding/fertiliser: Keep it light; use an all-purpose feed during the growing season. I garden organically, so I give mine very occasional doses of dilute comfrey liquid. The soil is pretty thin in their native habitat. Pruning: Best done before spring growth takes off, so prune to maintain shape at the end of winter/beginning of spring. Greenhouse-grown plants need a somewhat different regimen, but I won’t go into that. Pests/diseases: Not much of a problem around here. In very low humidity, watch out for red spider mites. Harvest: ‘Stella’ figs stay green when ripe, but the ripeness of any fig variety can be gauged by how they hang. Unripe figs stick straight out from the branch; as they ripen they droop lower until they hang more or less straight down. If you gently raise them and they come off easily, they’re ready to eat. Stop giggling. You have several options here, all depending on how much time/effort you’re willing to spend and what resources you have available. Probably the easiest thing is to send the plant into dormancy. When the weather starts to cool down and there is less light, the plant will start to drop its leaves and go dormant. When all leaves have been shed, bring it under shelter (as I said, they’ll survive light frosts, but don’t leave it out if a hard frost is forecast). During a mild winter, an unheated garage or shed will do, provided it isn’t opened often. Otherwise, a cool, dark spot in the basement will do as well – the same sort of place in which you’d overwinter summer bulbs. A cool greenhouse or conservatory is also a good option. The temperature range you’re looking for is about –4 to 8 °C; anything lower will kill the plant and much higher will cause it to break dormancy in a bright area – so keep them in the dark if you put them in the basement. A potted plant can also be heeled into the garden. Again, a couple of options are available. The plant can be laid in horizonally in a trench, backfilled with something loose, and the whole thing covered with thick mulch. The stems are pretty flexible, so another way is to heel in the pot at an angle and bend the plant over until it touches the ground, weight it down with a stone or two, then mulch. Alternatively, the plant can be placed upright and wrapped in insulation. Heel the pot in, mulch well, then tie the stems together in a bundle. Wrap in fibreglass insulation, followed by a tarp. A pot turned upside down over the top will shed water. If you do either of these against a south-facing wall, your plant will thank you. Your other set of options is to keep it growing over winter. The plant will adapt to lower light conditions than it likes, so if you have a nice sunny window, it will do just fine there. I’m fortunate in that my house faces southwest and has both a bay window and a skylight at the front, so I can keep a lot of houseplants without much additional light. Start acclimatising the plant to indoor conditions a couple weeks before your fall frost date. Growth will probably be slower during winter, but it will happen. You can even keep it indoors as a houseplant year-round, but don’t expect much of a harvest in this case. Small plants can easily be kept going under plant lights. The problem with this is they don’t stay small for long. You can of course grow them over winter in a heated greenhouse. If you have one, I hate you. During winter, water less and stop fertilising. In any case, as soon as danger of hard frost has passed in spring, you can restart their outdoor lives. For dormant plants, it’s as simple as unheeling (and/or unwrapping) your outside plants, or putting your dormant indoor plants outside. Plants that have been kept growing over winter will need to be reacclimatised as usual. If you’ve had a dormant indoor plant and move it to somewhere bright and warm, it will break dormancy and get a head start on the season’s growth (and also need acclimatising to outdoors). 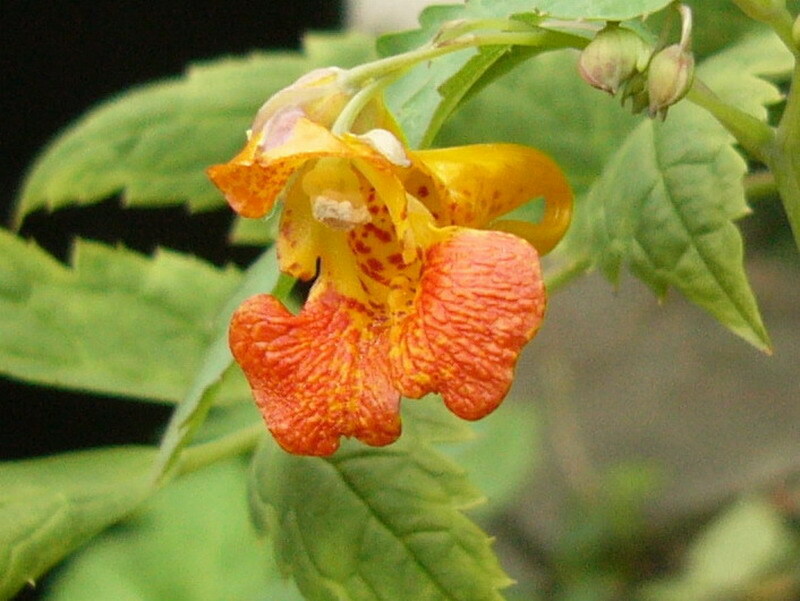 Impatiens capensis, commonly called orange jewelweed or spotted touch-me-not, is a North American native wildflower; like most temperate Impatiens species it is annual. Unlike the I. walleriana hybrids commonly grown in gardens, I. capensis grows about a metre tall and half as wide with an open, almost candelabra-like structure. The plant prefers moist, shady conditions, often alongside its close relative I. pallida, the pale touch-me-not, which has light yellow flowers and is otherwise very similar. It will grow in full shade but benefits from a bit of morning sun; it will also survive in sunnier locations if it receives enough moisture. As a woodland plant, it likes a light, humic soil, but it prefers clay over sand. Flowering begins in midsummer and continues until early autumn. Because of the open growth habit and the slender stems, the flowers almost seem to hang in midair when viewed against surrounding greenery. 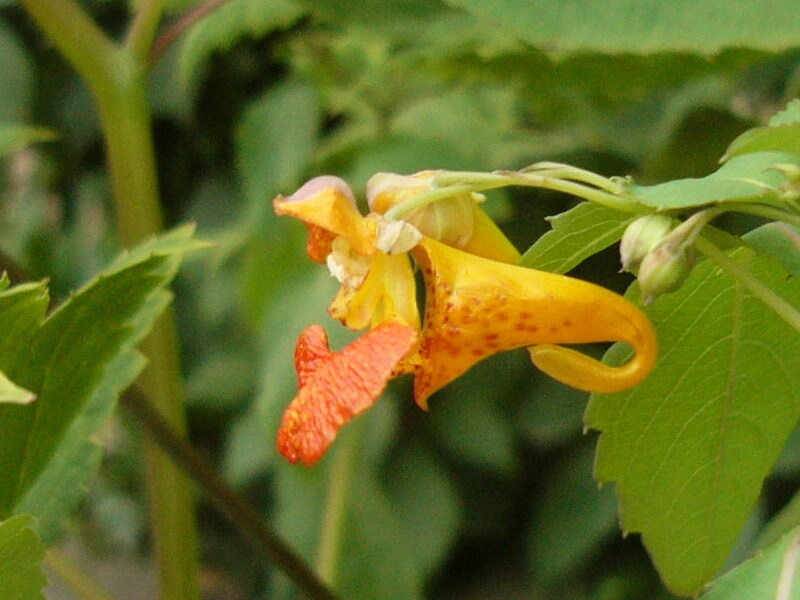 In the shady areas these plants prefer, flowers stand out very well (thought to be one source of the common name jewelweed). The small flowers are orange and yellow with orange spots and bonnet-shaped; I personally find the shape more like something out of the movie Alien. The spur at the back of the flower is a nectary and the flowers are pollinated by bees and hummingbirds. Seed-set begins in August. Seedlings unfortunately seem to be susceptible to damping-off, an invariably fatal fungal disease. This might be expected given the damp habitats the species prefers; on the other hand one might also expect it to be resistant to fungi exactly because it likes moist conditions. In any event, seedlings that survive into maturity are generally trouble-free and don’t even seem to be bothered by slugs. One issue is that, as mentioned, the stems are fairly slender and in the wild the plants are often supported by nearby growth; in the garden they have a tendency to fall over at the roots if they aren’t propped up. As in all members of the genus, the ripe seedpods explode on contact, sending the seeds flying all over the place. This provides the source of both the generic name Impatiens (impatient) and touch-me-not. Unfortunately, you’ll almost never find this species commercially available any more and few people cultivate them unless they have a wildflower garden. This is a shame because it introduces a valuable touch of colour into shady spots, and unlike the beleaguered standard I. walleriana garden bedding, it isn’t affected by the impatiens downy mildew that’s sweeping the continent (only that species and its derivatives are affected). As an interesting aside, the sap of this plant is held by some to be an effective antidote to poison ivy (Toxicodendron radicans) rash. I have it growing next to Solomon’s seal (Polygonum biflorum) and wood poppies (Stylophorum diphyllum). I originally got the seeds from plants growing wild in a local park (please harvest noninvasive wild seeds ethically! – no more than 10% from any one plant) and now I’m trying to get it to spread to all the odd shady bits of the garden. Fortunately, unlike so many wildflowers, this species is not under threat or endangered. Is anyone else having trouble with the so-called improved stats page? I’ve tried it with two browsers and nothing on the page seems to work: it just freezes. Okay, first winter post of things growing in the garden (that were deliberately planted, at least). I’m starting with this one because I like the sound of the Latin binomial. Aquilegia is derived from the Latin aquila, meaning eagle. It’s probably a reference to the shape of the flowers (like bird claws). The common name Columbine means dove and probably also refers to the flower shape. The specific name canadensis, means, believe it or not, “of Canada.” The common name for this species is the Eastern Red Columbine (or Eastern Wild Columbine): the species is native to (north)eastern North America. There’s a very similar species native to the western side of the continent called Aquilegia formosa…the Western Red Columbine. 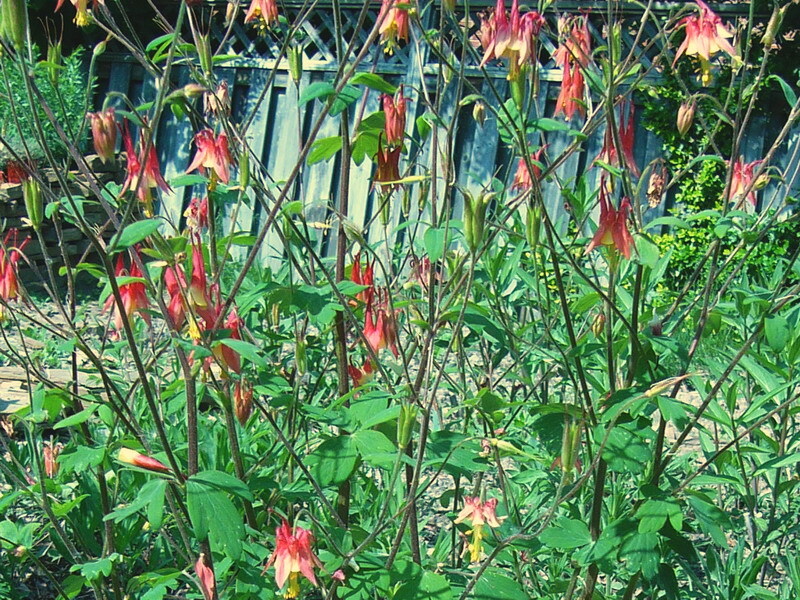 Like most columbines, A. canadensis is a short-lived perennial. It lives for about four to six years, but fortunately seeds very freely and the seeds do not require a cold period to germinate. They prefer disturbed ground (it doesn’t need to be too rich) and tolerate various levels of moisture. Unlike many other columbines, especially the various ‘Garden Columbine’ hybrids, it does just fine in full sun, although it certainly prefers a shady situation. The one in the picture below is growing in full sun. They form small clumps with flower stalks up to three feet tall. When the seeds ripen, the stalks often fall over, thus shaking out the seeds. Around here they’re mostly trouble free – like most plants in their native habitat. A bit of leaf miner damage is to be expected, but in this case it’s seldom enough to affect the plant and is more of a cosmetic concern. Theoretically they ought to attract hummingbirds, but mine always flower just before the annual hummingbird migration gets this far north: late spring (the hummingbirds arrive in summer). Deadheading may encourage a second flush of blooms. Pretty much all Aquilegia species hybridise quite readily with each other, so to maintain a stable population different columbines should be planted as far as possible from each other.